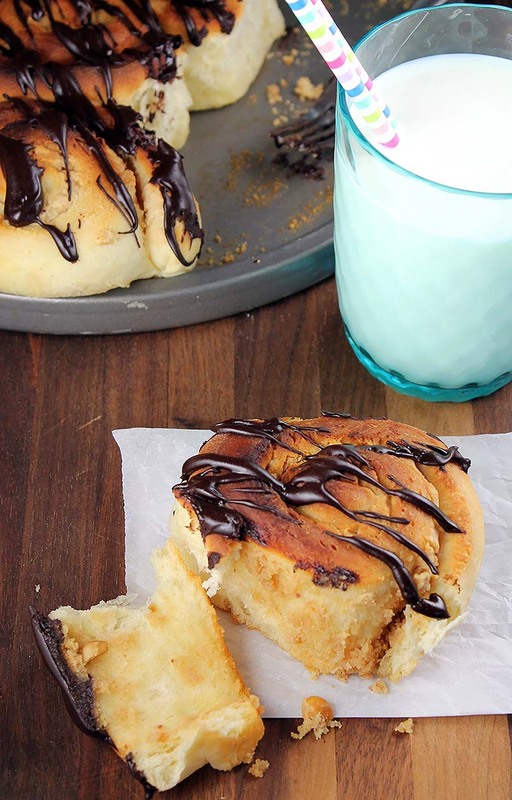 Indulge in these light and fluffy sweet rolls with just a touch of peanut butter filling and a delicious chocolate glaze. Add milk, butter egg, sugar and yeast into a mixing bowl and whisk together to combine. Let set 5 minutes or until mixture starts to bubble. Add 1 cup of flour and salt to the yeast mixture. Stir together adding 1- 2 cups of additional flour until dough comes together. Turn dough onto a floured surface and knead for 3 to 5 minutes, until dough is smooth and no longer sticky. Add more flour as needed, until dough is soft and elastic. Cover and let rest 45 minutes to 1 hour. Prepare filling: In a mixing bowl combine peanut butter, cream cheese, butter and powdered sugar until smooth. Roll dough to about a 10x12- inch rectangle. Spread filling evenly over dough. Roll up from the long side, pinching the seam together. Cut into 12 slices with a sharp serrated knife. Place on a greased baking sheet about 2 inches apart. Cover and let rise about 1 - 1½ hours. Preheat oven to 350°F. Bake for 12-15 minutes or until rolls are golden brown. Cover loosely with foil the last 5 minutes to prevent over-browning. Prepare glaze: Mix cocoa powder and powdered sugar together and whisking in milk, 1 tablespoon at a time until desired consistency. Drizzle over baked rolls. Serve warm or at room temperature. Best if enjoyed within 1 day of baking. Store leftovers, covered in refrigerator.